Sony and Samsung are among the best player in the smartphone and phablet industry and offers the customers a wide range of useful products. Their devices are a huge hit among the customers worldwide and the fans wait for their latest releases in anticipation. The Samsung Galaxy Note 3 and Sony Xperia Z Ultra are their hot selling products and the following is a brief comparison of these great gadgets. Samsung has really impressed its fans with the design of Note 3. 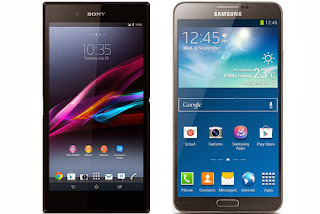 The phablet looks great and in spite of a large size, it’s comfortable to hold. Samsung has really improved the build quality and the dimensions of Note 3 are 151.2 x 79.2 x 8.3mm with the device weighing just 168 grams. On the other hand, Xperia Z ultra is equally good and has got slightly bigger dimensions of 179.4 x 92.2 x 6.5mm and weighs 212 grams. The device has got straight lines and a premium look and is dust and water resistant. The Galaxy Note 3 comes with a brilliant 5.7 inch Super AMOLED display that is backed by a resolution of 1920 x 1080 pixels that supports a density of 386 ppi. The colors are detailed and sharp and look too good. On the other hand, Sony has provided a 6.4 inch Full HD display that is backed by a density of 344 ppi. The triluminious display of the device is surely amongst the best display technology introduced by Sony till date. These devices are driven by the Qualcomm quad core Snapdragon 800 processor which complements the Android Jelly Bean installed in the devices. The only difference in the operational performance is the RAM, as Samsung Galaxy rests on 3GB and Sony Xperia Z ultra on 2 GB RAM. As phablets can perform multiple functions they have to carry enough memory on them and Xperia Z Ultra and Note 3 comes on both 32 GB and 64 GB variants. If you still feel the lack of space, you can use the additional 64 GB space of the memory card. Samsung Galaxy Note 3 boasts of having a brilliant 13 MP camera along with a 2 MP camera that can be used for video chats and calls. On the other hand the camera of Xperia Z Ultra stands at 8 MP, yet is much snappier than the Note 3 camera. The 2 MP front camera provides same options as that of note 3. Anzer Khan is a professional article writer and specializes in writing articles on web designing and mobile phones. If you are looking for some good Samsung Galaxy Note 3 contract deals, then do visit http://www.samsunggalaxynote3contracts.com.